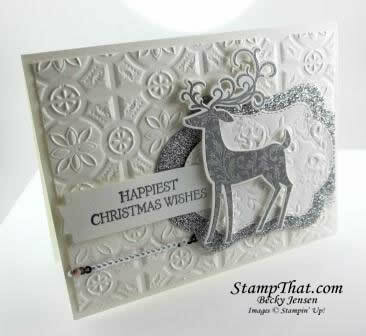 We used the Dashing Deer stamp set in the Extreme Embossing class, and I think that is my favorite card from the class. We used white and silver with lots of embossing, glitter, and sequins. How can you go wrong with that?! As pretty as it looks in the picture, it’s much prettier in real life! It’s hard to catch the glitz and glimmer in a picture! The Dashing Deer stamp set will be available on Wednesday when the Holiday catalog goes live. You’re going to like it! Thank you for stopping by today. I hope you are having a great day with friends and family!